We used to make these cookies together when I was little. They are very unique – a little fiddly, but they taste amazing! This is a cookie that isn’t very sweet – they are tender and buttery, with a fluffy but dense texture. The lemon zest and hazelnut add a special, delicate flavor. They are such a treat, and they were a big hit at the party! Dad was so happy when he saw them! Cream butter with sugar until light. Add sour cream and egg yolk and beat until well blended. Add next 3 ingredients and mix well. Chill until firm enough to handle. 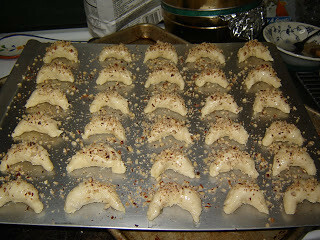 With hands, shape pieces of dough in 2″ crescents 1/2″ wide and put on cookie sheets. The easiest way to do this is to pinch off a heaping tablespoon of dough, roll it between your hands, applying pressure to make the ends narrower than the middle. 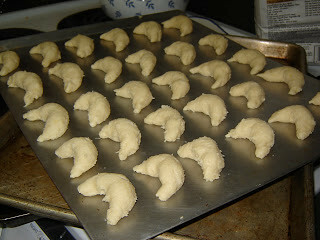 Then place on cookie sheet, curving ends into a crescent moon shape. Beat egg white slightly with a fork and brush on crescents with a pastry brush. Sprinkle with nuts. Mix cinnamon with 2 tablespoons sugar and sprinkle on cookies. Bake in preheated 350 degree oven for 15 to 18 minutes. Remove to racks to cool. Makes about 6 dozen. 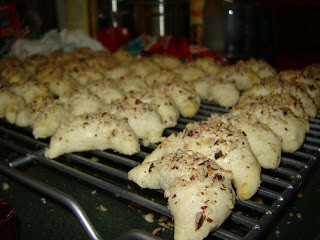 This is what the dough should look like after you mold the dough into crescents. 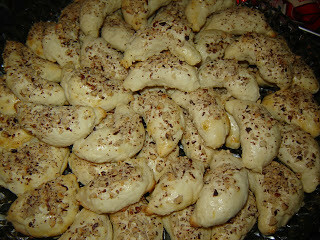 And this is what they should look like when they come out of the oven! Just lightly golden brown on the tips!